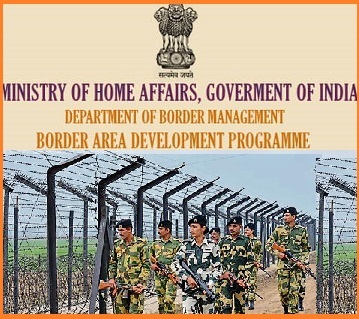 The Border Area Development Programme (BADP) scheme is being implemented by Union Home Ministry in 367 border blocks of 104 border districts in 17 states. The Border Area Development Programme (BADP) scheme main aimed to meet special developmental needs and well-being of people living in remote and inaccessible areas situated near international border areas. BADP scheme also aims to saturate border areas with entire essential infrastructure through a convergence of Union, state, BADP, local schemes, and participatory approach. Under BADP schemes sub-scheme include construction of primary health centres (PHCs), connectivity, schools, the supply of drinking water, community centres, drainage to enable sustainable living in border areas. BADP scheme also covers schemes or activities relating to skill development programmes, promotion of sports activities in border areas, promotion of rural tourism, border tourism, protection of heritage sites, Swachhta Abhiyan, construction of helipads in remote and inaccessible hilly areas, which do not have road connectivity. Skill development training to farmers for use of modern and scientific techniques in agriculture, organic farming is also part of BADP now. As many as 61 model villages are being developed under BADP to improve the quality of life for people living near border areas. A total of Rs 13,400 crore so far have been released since the BADP programme was initiated in 1986-87. Recently, on 5th November 2018, the Union Ministry of Home Affairs released Rs 113.36 crore to 6 Border States under the Border Area Development Programme (BADP) to improve the condition of people living in these isolated locations. These six Border States are Assam, Nagaland, Sikkim, Gujarat, Rajasthan, and Uttarakhand.